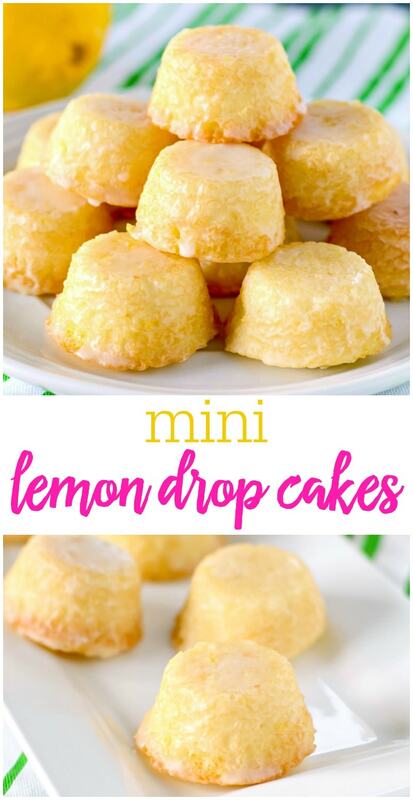 These mini Lemon Drops are a perfect treat for lemon fans. 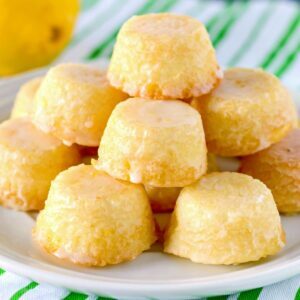 Tiny lemon cakes are drenched in a mouthwatering lemon glaze making them delicious and addicting. I am a huge fan of all things lemon, and these Lemon Drops are my latest experiment. The original recipe called for a cake mix, but it made 75 lemon drops. I didn’t need that many, so I decided to come up with my own recipe. I am thrilled with how they turned out. I took them to a bridal shower, and they were a big hit! 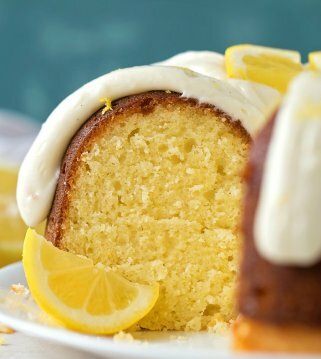 They are soft and buttery, and the lemon glaze soaks into every nook and cranny, making every bite delectable. Be careful, they are hard to stop eating! 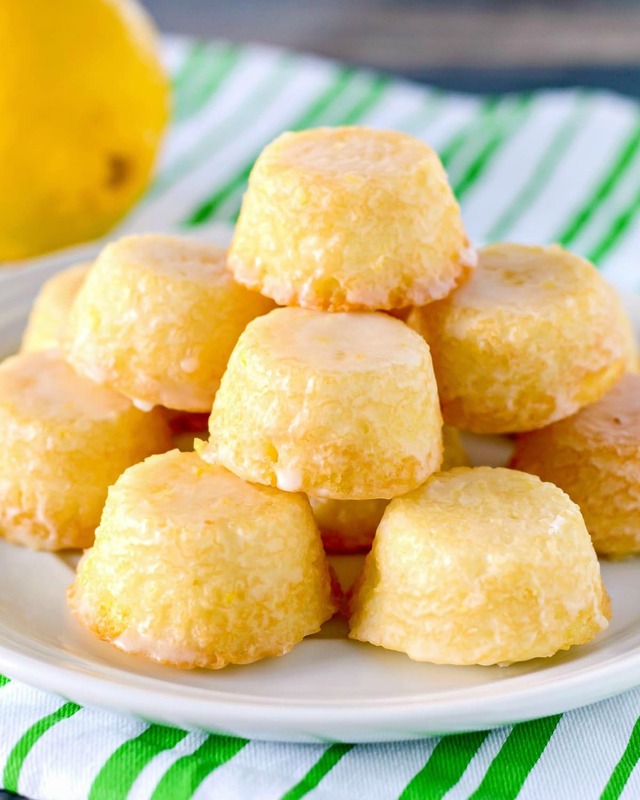 Don’t worry, even though they are from scratch, lemon drops are easy. You start off by bringing butter and water to a boil, and pouring them over your dry ingredients. Next you add your sour cream, egg, lemon juice, and zest. After beating everything till smooth, you add the batter to your prepared mini muffin tins. I used two 24-cup pans. I like to use my mini cookie scoop to fill the cups. So handy! 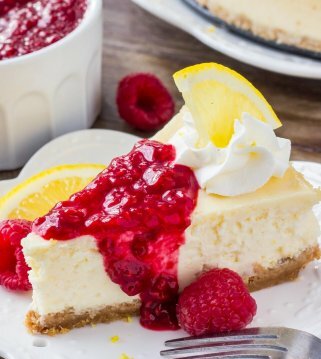 Fresh lemon zest is the secret to incredible lemon flavor, so don’t leave it out. 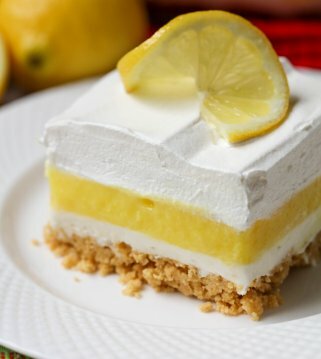 If you love lemons, you are really in for a treat! We love all things lemon, especially in the summer time, and we hope you’ll love these mini lemon cakes (aka lemon drops) for your next get together. I’m warning you now that they’re addicting, so beware!! Scoop batter into muffin pans. Bake at 325° for about 12 minutes. Let cool for 5 minutes, then turn onto cooling racks. Cool completely before glazing. Dip lemon drops bottom side down into the glaze. Let excess glass drip off into the bowl, then invert lemon drops top side down onto cooling racks. (Place waxed paper underneath the cooling racks for easier clean up.) Let sit till glaze hardens. 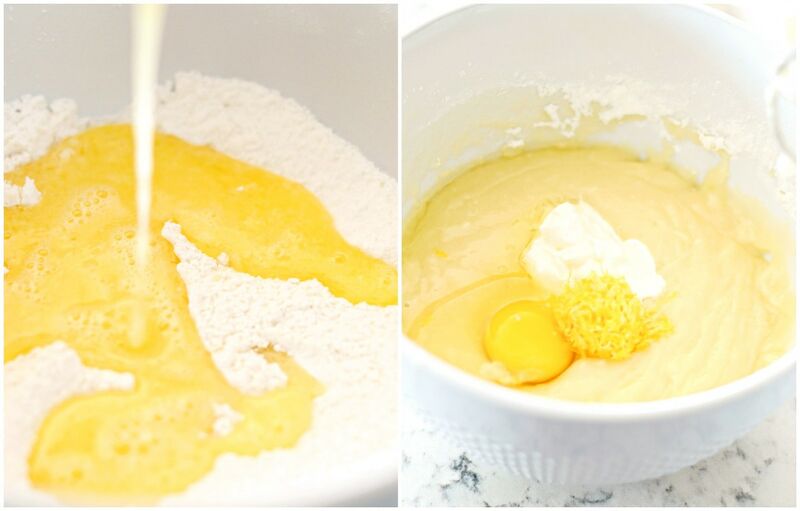 Whisk all glaze ingredients together in a small mixing bowl. Heat for about 10 seconds in the microwave till glaze is very thin. I hope you like the ones you try 🙂 Thanks for stopping by! Yum! I have been looking for a recipe like this – can’t wait to try it. 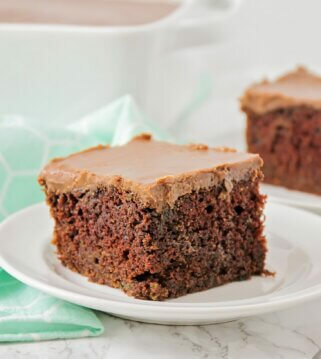 I always get disappointed when I research a recipe and find it’s based on a commercial cake mix… this looks so much better. If I don’t have tiny muffin tins can the batter be put into a jelly roll pan and cut into squares? I personally haven’t tried, but I bet that would work 🙂 Good luck!! Thank you! I hope you do!! I made these tasty mini muffins last year, for my great niece’s 3rd birthday party. Her grandmother remembered them and asked me to make them for a baby shower, tomorrow. What a compliment with so many recipes around, to remember this one. Was wondering if they could be frozen. 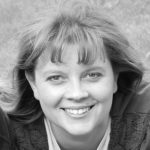 I am doing the sweets table for my son ‘s wedding next summer and need delicious mini desserts that I can make ahead and freeze. I haven’t tried. I would maybe half the recipe & try way in advance, so you’d know if they are ok. They would be a hit!! 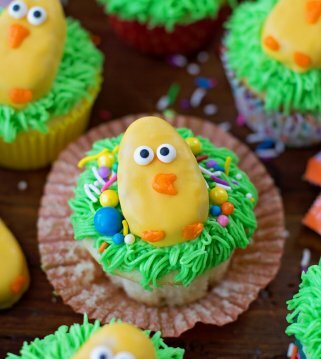 these look amazing cant wait to bake them this afternoon, got all the ingredients Yippi Ya Hoo!! I’m so excited thanks so much for posting this recipe. You are so welcome!! I hope you like them! I have just made these but only got 24 from the mixture, did you double the recipe? Have yet to do the glaze as they are cooling but even without the glaze they are lovely, thanks. Good day. I would like to know if I can use cupcake holders for this recipe. Are we supposed to sift the flour? My lemon cakes tasted a little heavy and maybe too flour-y? No, but you sift it with the other ingredients. Did you sift it? THis is my second time making these they are delicious light & lemon so good . I have such a time removing from the pan. They look ragged buy the time I get them out . Sides are ok its the bottom , is there a secret ??? Did you spray really well? I make sure I do. I haven’t tried with the paper liners. After you spray, you could sprinkle with a little flour, too. Sure hope you like them! Thank you! Oh, darn! I am so sorry! Sometimes, I go a little crazy with the spray, because I know things still stick. I like to sometimes, sprinkle a little flour after I have sprayed. I appreciate you trying them! 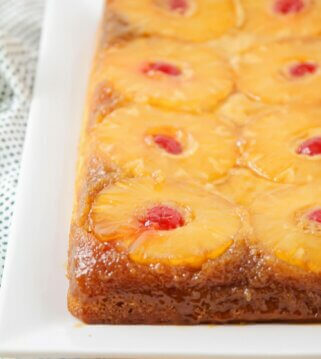 These were so yummy…melt in your mouth goodness! I made them for my hubby to take to work and everyone raved! I’d like to try an orange creamsicle version but not sure if the orange would be a strong enough flavor…thoughts? That would be good!! Thank you for sharing that! So glad everyone liked them! Oh, darn! I am sorry! Yes, I had to grease it really well & a couple still stuck.